Perhaps you are one of the many Americans out there who is concerned about recent immigration policy changes and how it may affect you or your loved one’s livelihoods. Although it is difficult and often imprudent to extrapolate and therefore speculate, the purpose of this post is to educate you in a general way about what to look for if you are in considering retaining an immigration lawyer. Of course, we recommend employing the expert services of TATE BYWATER if you are in the Fairfax or Prince William County regions. First, let’s discuss why immigration lawyers are beneficial. Generally speaking, immigration attorneys are adept in handling legal issues. A Vienna lawyer from TATE BYWATER, just any immigration lawyer worth his/her retainer, should be knowledgeable and experienced, able to guide you step-by-step through the entire process, be it business immigration, citizenship, family-based immigration, or even asylum relief. Immigration lawyers will also help you avoid delays because of improperly filed paperwork (believe us, it happens more than you would think). There are multitudes of forms and visas, each with their own strict set of requirements to even be considered for approval. While some may see it as a superfluous service, it is better safe than sorry when dealing with matters of this significance. 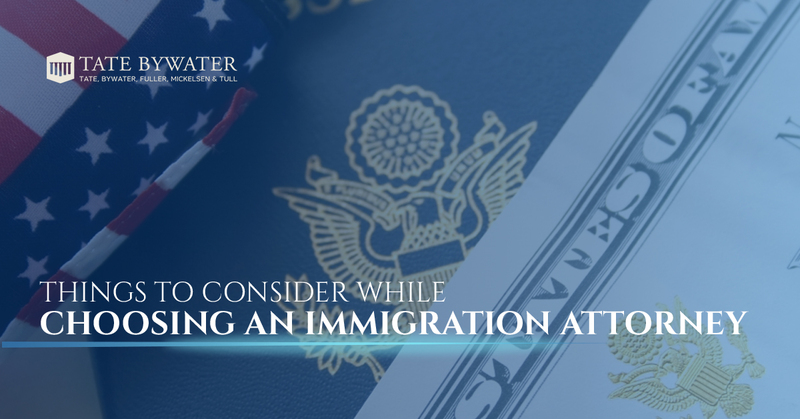 An immigration attorney can help you complete all required paperwork, guide you on what information to include, and ensure best practices are employed throughout the process. We recommend not trusting a host of unverified online forums and strangers to inform you on how to file forms which are, let’s face it, vital to you and your family. On the other side of the coin, you want to make sure that the immigration lawyer you do end up selecting is one who is a) capable and b) dedicated to your cause. Applicants should be well-measured when they think about who they retain to represent them. Be sure to always check your representative’s credentials, as there are people out there wanting to take advantage of anyone they deem as vulnerable. Make sure your attorney is staying in communication with you about each step of the process. In contrast, the immigration services provided by the attorneys at TATE BYWATER are exceptional. We encourage you to peruse our testimonials page to get a feel for the quality of legal counsel we consistently provide. Our dedication is not only towards getting our clients positive outcomes, but making sure you feel cared for and informed along the way. It is important to note that the simple act of hiring an immigration lawyer does not give you preferential treatment in the eyes of the government. What it should do, however, is save you from falling victim to human error. Many times immigration application refusals are contributed by people deciding to go solo because they think that the government is on their side, and eventually it will all work out. At the risk of sounding trite, you’re better safe than sorry. If you are in the greater Washington D.C. area, get in touch with our legal representatives at TATE BYWATER today.